AMMONNEWS - His Majesty King Abdullah on Wednesday received cables marking the 20th anniversary of the assumption of his constitutional powers, which falls on Thursday, 7 February. The cables’ senders senior officials, army officers, heads of security agencies, and representatives of civil society organisations paid tribute to His Majesty the late King Hussein and his achievements over 47 years. They also praised King Abdullah’s leadership over the past two decades, and his efforts to ensure Jordan’s continued prosperity and progress. 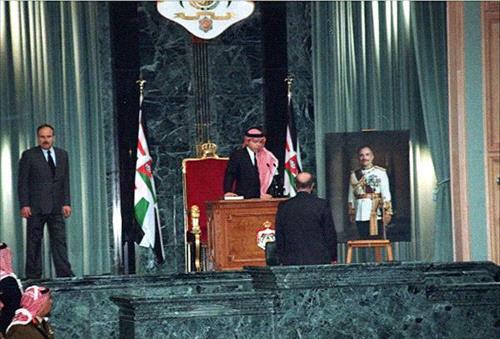 They underlined Jordan’s international stature and its role, led by His Majesty, in defending Arab and Islamic causes, commending the King’s efforts in spreading Islam’s message of tolerance and moderation. Under His Majesty’s leadership, they said Jordan has continued its progress and remained an oasis of security and stability.